Google is really scary. On the other hand, Google brings the world closer together. And it’s with that idea that I’m going to take my readers on a little tour of my life. I’ve move around a lot in life. Such is the life of a minister’s kid. Spent years in central Africa. Lived all over Maryland… twice (getting ready for a third time). Lived in snowy New York. Lived all over. Usually if I were to give someone a tour, I’d have them in a car and drive around through old neighborhoods, passing by old houses, telling stories. I’m going to do that now because I’m in a reminiscing mood. It started in Tonawanda, NY – a city-suburb of Buffalo. The very first home I lived in on Roswell Ave. Sadly, I don’t know anything about that place because I was too young to even remember it. My first memories of life happened on Longnecker St in East Buffalo. I actually have a surprisingly good recollection of this place. I remember that it was in this place, my dad who was a line man for the power company, would come in with ice in his beard. I remember when he put in a wood burning stove into the house and built the chimney. Never have I felt a hotter heat than that. I remember the milk machine on the corner of Lovejoy and Longnecker. Yes, we had milk machines back in the 70s. I lived in the Lovejoy neighborhood, which was always a sketchy place to live but has become a terribly drug-ridden neighborhood today even since my earliest memories in the early 80s. In 1984, my parents moved us out to the Democratic Republic of Congo (then Zaîre) where they were missionaries. I remember these days very well. How many American kids can really say they spent time growing up in third world Africa? Not many. Sadly, Google Street View has not gotten to Kinshasa (and probably won’t for awhile), so I rely on what photos are available of the area nearby where I lived. Here is a photo of the Rte de Matadi, a “highway” that runs between the capital city of Kinshasa and one of the provincial capitals, Matadi. It, to this day, is one of the few usable inter-city roads in the country. Bukavu was an interesting 6 months of my life. We moved from Kinshasa to the eastern side of the country to a provincial capital surrounded by rain forest. It was quite isolated. We lived in an old hotel that was turned into a sprawling palatial duplex with another American family living in the other side. 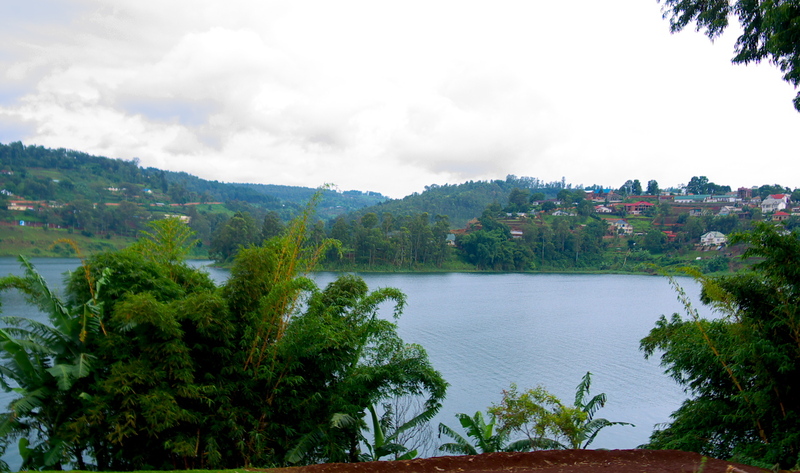 This estate sat on top of the highest point in the city and overlooked Lake Kivu, one of Africa’s Great Lakes that is torturously poisoned by methane gas from the volcanic activity in the region, and unsafe for humans, to the north and across the border into Rwanda to the northeast. For the recent history buffs, during the genocide that continues to happen but began in Rwanda (Think Hotel Rwanda), Bukavu became a refugee camp for people streaming across the border. In fact, CNN reported on this development in the early 1990s from my front lawn. I did not live there anymore, but nonetheless… that happened. The time in Bukavu was short-lived as the entire family contracted a form of airborne Hepatitis. No, we were not all promiscuous, what with me being the oldest of 3 at 11 years old. It’s just life in a third world country and is the reason that, to this day, I cannot give blood – and never will be able to. My dad was evacuated to Nairobi, Kenya for emergency medical attention and we all flew home to Buffalo for observation and testing shortly after that and lived there a year before we were cleared medically to return. During 1987, we lived in a little house in the Buffalo suburb of Depew. This is where I lived (I believe :P). In 1988, we moved back to Kinshasa. Political forces that were the ominous clouds of what would ultimately come were brewing and after a year, we, along with several other American families, were ejected from the country. While some returned, we never would. In 1991, revolution would overcome the country as tribal hatred spread from Rwanda into Eastern Zaïre and would continue until dictator “President” Mobutu Sese Seko would overthrown and exiled by rebel forces led by Laurent Kabila. The civil war continues in parts of the Congo today. This is a satellite view (again, no street view, but the satellite imagery is far better than when I looked at it last – nice work, Google) of a mostly American neighborhood named Joli Park. On our street, almost all residents were American and Canadian missionary and embassy workers. After returning from Zaïre, we moved to Maryland. Of all my U.S. experience at the ripe old age of almost 13, I’d never lived outside of Buffalo. I was not prepared for the intense summer humidity and change of lifestye. I learned how to catch crabs with just a piece of twine and chicken bait tied to the piers here at Hunter’s Harbor on the Magothy River in Pasadena, MD. While in that neighborhood, I lived in this house for a year and made friends with my next-door neighbor, Tim, who introduced me to the finer things in life like Teenage Mutant Ninja Turtles and Mega Man. It was also at this house that I encountered my first, and thankfully only “Warrior Turtle” – a three-legged alligator snapping turtle that looked like he had personally won World War II for the Allies and was looking to make sure someone paid for it. As a bonus, I played my one and only play in high school football at Severn School where, as a member of the JV squad (and mostly practice at that), I was sent in to play a route as a WR… I wasn’t going to get the ball. I was just going to run a route. As a defensive back by position, I was so nervous I lined up 7 yards off the line of scrimmage instead of on the line, as a receiver should, and the play was whistled dead for illegal formation, thus ending my illustrious high school football career. In the next two years, I lived in two more houses. I began my working life at first, beginning a job at Wendy’s 2 blocks from my house. To this day, I have a few people I keep up with. I hope that tomorrow, when Maryland approves Question 6 allowing marriage equality in the state, I will be able to attend my old boss’s, and current friend’s, wedding to his long-time partner. Which leads me to Lima, NY and Elim Bible Institute. Once upon a time, I wanted to be a preacher. So I started doing what I was supposed to to become one. That meant enrolling in Elim, and moving north to the great one-stoplight town 17 miles south of Rochester – Lima, NY. I never was good with academics, though, so this really only lasted a year. Also, my family moved up there too which put more pressure on me as a young adult trying to find my own way in the world. I’d leave after only a year on “The Hill”. At least Google got this photo on the one day there wasn’t piles of drifting snow. I took my talents, in October of 1996, to Astoria, Queens where I would live for two years and fall in love with the City. I still love New York to this day. Living on a small stipend plus room, board and meals for free, I volunteered my time with an organization that worked largely with the homeless population in the city, the New York School of Urban Ministry (or NYSUM). I owe the two years I spent in New York for my personal bias toward New York-style pizza, public transportation, and dangerously safe driving. I also owe my time in New York to where my mind began to open up to more progressive, and non-traditional philosophical ideas, much to the dismay of the religious leadership around me. In Oct of 1998, I left NYC and went back to Lima for a short time. It was a few months after that, that I moved back to Maryland in an old Chevy S-10 pickup truck my dad gave me since I was broke and couldn’t afford a car and he needed a new one anyway. In all rights, that truck shouldn’t have made it past the Village line, but in fact it got me to Baltimore and gave me wheels for a month or two before it finally choked. I holed up in a Glen Burnie apartment where I worked multiple jobs and would eventually meet a girl who would become the mother of my son a few years later. Although we didn’t last, this period is somewhat memorable for me. I would get married 22 months later and we would find the cheapest place we could afford, even if it meant living out in the country. That led us to a single bedroom apartment adjoined to a house on acres of land in the middle of nowhere, Carroll County, MD (for which I have no visual evidence). When we moved again, to be closer to work, we’d hole up in a basement apartment in a private home. It was terrible. In 2003, we bought a house on the Baltimore City/County line and lived there for 18 months, selling before the housing market imploded. It was in this house that we had our son, Devin, who is now 9. I was working as a contractor for the Navy in DC and had decided at the age of 27 to enlist. A long story why that didn’t happen would follow, but sufficed it to say, that never transpired. The house is bigger than what it looks like and wasn’t bad for a first home. In 2004, we moved into a smaller apartment that was supposed to be temporary until I shipped for basic training and got my orders. Like I said, that never happened so what was meant to be a temporary solution ended up being home for several year. Essentially until our divorce. I moved to Alexandria, VA to live with a friend for about six months in late 2008-09. I won’t post his home because he still lives there but then, it was back to Maryland. I was feeling the DC thing after Baltimore. I had begun to develop friendships with DC folks and as a newly single man, I like the opportunity for some level of anonymity while I explored my new world in a new city. It was really quite awkward, looking back, but I enjoyed it nonetheless. I would live in Bethesda, MD from 2009-2010, almost 1.5y. Google doesn’t take it’s car back there. I can only imagine that when they passed by, it was the 2010 #Snowpocalypse and they couldn’t get in. Now I’m in Austin. I won’t show you these photos either, for privacy, and I’m moving back to Baltimore, God willing, in January. So the saga continues. I really wanted to just share this stuff though. It makes me nostalgic and technology is both terrifying and amazing.